Warranted cover-stickerage, happening here. This is an elegant interwoven medley of dark journeys speckled with hope. Mandel's language and narrative cast a spell. Not only does her poetic wordsmithing and imagery elicit literary swooning, she has these confident flash-forward moments that break the fourth wall and continue to lure and pull you along. The characters are all flawed. I wasn't taken with any in a huge way (but if I had to choose a favourite, it has to be Miranda! ), and yet I was never disappointed to receive updates on any characters' status. I found this a highly atypical experience; to lack investment in the individuals and yet feel very invested in the overall character tableau...that is what it feels like, to me -- a carefully curated exhibition of experiences to absorb as a whole. Disclaimers for sensitivities: some swearing, some violence, some disturbing/seriously sad content, and sexual references. No detailed sensuality, no dwelling on the gore, no over-exploration of the sadistic. Some of the post-apocalyptic moments are golden. I love that stuff, you know I do. 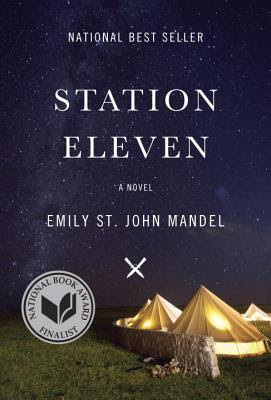 The outbreak/plagues tale isn't new, but the treatment, character response and form in Station Eleven is something special.